The book on PLS-SEM includes a chapter on (multiple) mediation: Hair, J. F., Hult, G. T. M., Ringle, C. M., & Sarstedt, M. (2017). 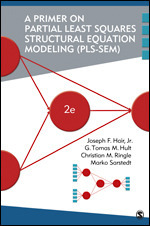 A Primer on Partial Least Squares Structural Equation Modeling. 2nd Ed. Thousand Oaks: Sage. cringle wrote: The book on PLS-SEM includes a chapter on (multiple) mediation: Hair, J. F., Hult, G. T. M., Ringle, C. M., & Sarstedt, M. (2017). A Primer on Partial Least Squares Structural Equation Modeling. 2nd Ed. Thousand Oaks: Sage. Does a multiple mediation only occur if an exogenous latent variable is mediated by at least two mediators, or does one also refer to multiple mediation in the case that one has multiple exogenous variables which are mediated by the same mediator (e.g., IV_1 -> M -> DV and IV_2 -> M -> DV)? Is it common to also conduct a mediation analysis for models where such effects where not hypothesised? 1. Does a multiple mediation only occur if an exogenous latent variable is mediated by at least two mediators, or does one also refer to multiple mediation in the case that one has multiple exogenous variables which are mediated by the same mediator (e.g., IV_1 -> M -> DV and IV_2 -> M -> DV)? On usually refers to the first case. However, also the relationship between two endogenous latent variables may be mediated by one or more mediator constructs. 2. Is it common to also conduct a mediation analysis for models where such effects where not hypothesised? Yes, that what you usually do. Otherwise, it's a kind of random search since a more complex model easily includes many mediation model (intended and unintended). Moreover, I'm not sure if I need to use the one-tailed or two-tailed test statistic for assesing mediation effects (I used the one tailed statistic for the PLS algorhytm since I assume negative effects on the DV). @1: There is no general rule. It depends on what you like to analyze. @2: Again, it depends. If only one direction is possible, you do a one sided test, otherwise conduct the usual two-sided one. sorry for bothering you again, but there has been coming up another question referring to multiple mediations (which I could'nt find in the forum). Is it possible (and advisable) to interpret a signif. total (indirect) effect even when one specific indirect effects is not significant (and the second one is significant)? It always depends on the implications you want to draw (and can draw based on the results). If you are interested in the net effect, shouldn't you be interested in the total effect and not the total indirect effect? thanks for responding. Yes, I got your point. But due to my model specification, I only hypothesize an effect from A (Complexity) -> B1 (Attitude) and B2 (Subjective Norm) -> C (Intention) (multiple mediation), and no direct effect from A -> C. Am I right, that in this case the total effect = total indirect effect (as the outcomes of the PLS Algorhytm indicates)? Yes, if you have no direct effect in your model the total effect = total indirect effect. I just wanted to do the calculation of multiple mediating effects in the Excel-Sheet provided online (found it on https://www.pls-sem.net/app/download/15 ... 1485782413), but I just read in another thread that @jmbecker stated that in SmartPLS version 3.2.6, "those specific indirect effects with all necessary calculations" are included. Now, does that mean that for the analysis of multiple mediation, the SmartPLS output of the specific indirect effects suffices? Therefore, for an interpretation, I would look at the total indirect effect, check its significance, and then further elaborate on the specific indirect effects, correct?